Guyana Goldfields Inc. which operates the Aurora mine in Region Seven, has announced production of 36,600 ounces of gold for the first quarter. Guyana Goldfields Inc., which operates the Aurora mine in Region Seven, has announced production of 36,600 ounces of gold for the first quarter. On January 14, 2019, the company, Guyana’s biggest gold mining operation, stated that first quarter gold production would be similar to its fourth quarter 2018 production of 42,750 ounces, based on the now obsolete 2012 resource model. The disclosures would come as the Canadian-owned company, facing a bid by a number of shareholders to sack the current board, citing poor performance, will be holding an annual and special general meeting on May 22nd. In the first quarter of 2019, the company said it significantly improved mining and milling volumes compared with the prior year. Gold recovery averaged 90.5% for the quarter, compared with 91.7% a year earlier. The company completed the mill expansion, which is anticipated to enhance capacity and redundancy of the primary crushing circuit and expected to further lower per unit costs. Work on the underground decline will resume in the second quarter. 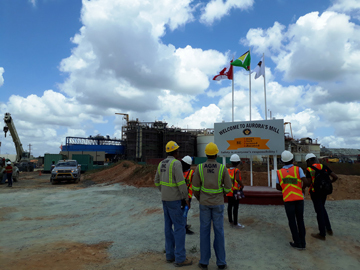 On April 4, 2019, a group consisting of senior Guyana Government officials and media visited the Aurora Gold Mine. The Company has submitted an application for an underground mining permit to the Guyana Geology and Mines Commission. If approved, the Company proposes to commence commercial underground mining in 2022. Underground operations would be expected to add 300 people to the current work force of approximately 720.